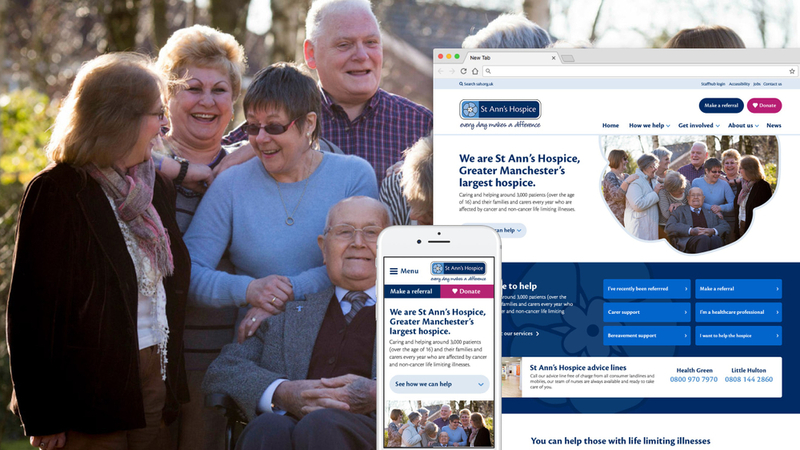 After 10 years and some massive changes, St Ann’s hospice approached Reason Digital to update and revitalise their existing website to bring it inline with their current communication strategy. 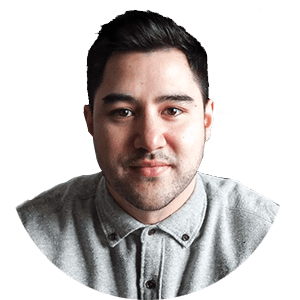 My role during the project was to assist in the stakeholder workshop, and to take the analysis made by the strategy team to produce a solution using wireframes that were then presented to the St Ann’s. We travelled to St Ann’s base in Heald Greene, Cheadle to hold a a stakeholder workshop, this allowed us to undertake vital discussions and exercises that ranged persona creations, card sorting, and empathy mapping. Together we defined a series of objectives, raise awareness, create financial sustainability, showcase the brand and position St Ann’s as a centre of excellence. 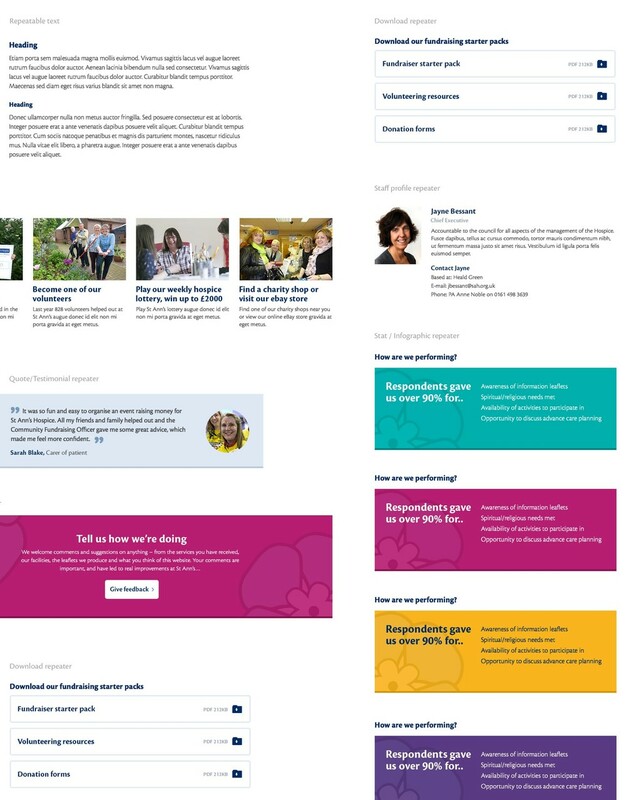 Based on the user insights we gathered on the service user, donor, volunteer, fundraisers, carers and staff the new site would need to be understand; everything needs to be simple and clear, no jargon, no unnecessary language or sections, focus on user terminology. The audiences are usually time poor, navigating the site must be a simple, common sense process. Many of the audiences look to St Ann’s for useful practical advice and resources. We showcased the hospice; displaying the amazing service done by the expert hospice teams, shouting about this and to shine a light on everything they do. St Ann’s have a fantastic communication team and strategy, this meant they have a great resource of content available. 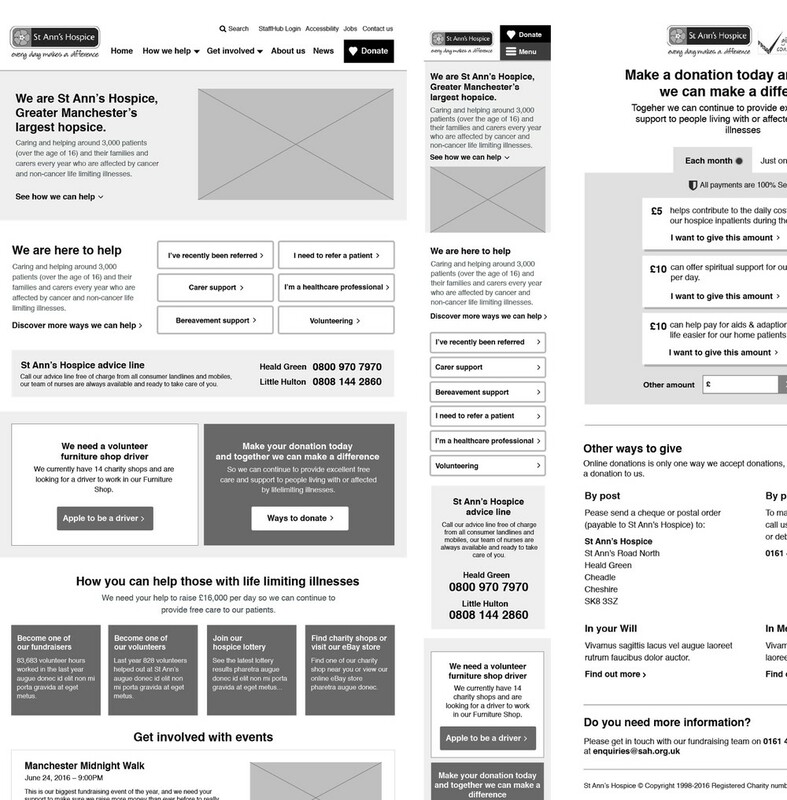 By having examples and a clear strategy this better informed my decisions whilst in the wireframe stage. I was able create solutions using Wordpress’s Flexible Content Repeaters to explore how their content could be best served. Following on from the wireframe stage, I moved into designing the fundamental visual elements for the site. Using the wireframes as a reference I was able to have deep discussion with the development team members on functionality. Together we created a design system that would see us throughout the project. Designing in a modular approach allowed the team to see how content repeaters, and UI elements would create reusable templates the CMS admin would be able to curate themselves. 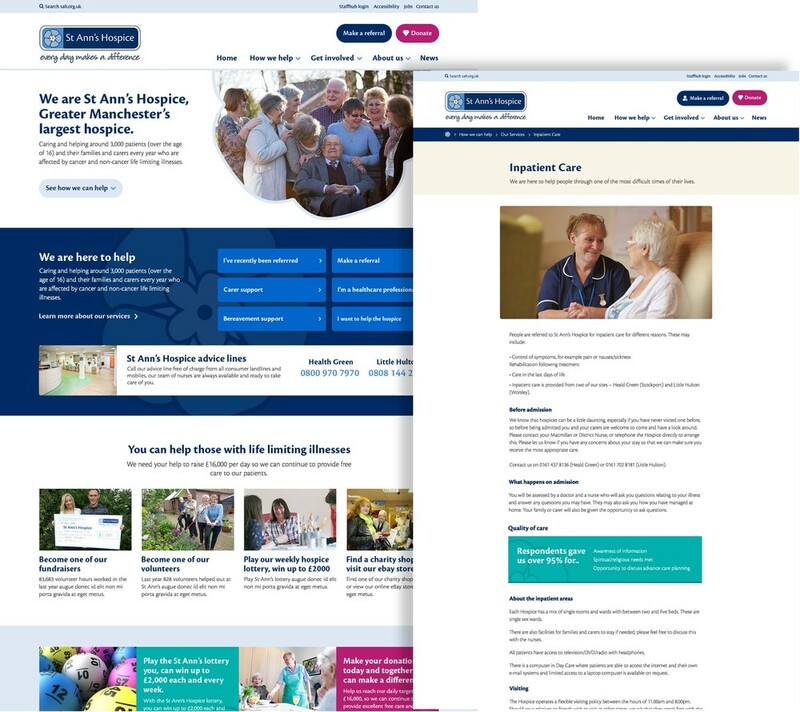 On the specific style of the design of the new St Ann’s website, I went with a colour palette that was warm and comforting. Service users especially would be visiting this site in a time of great stress, but also we had to address the fundraisers – therefore the site had to have a professional, sincere but also at times an energetic and actionable vibe.